Open-face Chinese poker (OFC) is a turn-based card game, which has become popular in the poker community, especially among high-stakes gamblers, since its invention sometime in 2011. Open-face Chinese poker (OFC) evolved from closed-face (“regular”) Chinese poker, but it is not necessary to know the rules or strategies of regular Chinese poker in order to enjoy OFC. Like other poker games, OFC players take turns drawing cards from a single deck, trying to make the best possible hand, while their competitors do the same. Unlike other poker games, however, there are no bets placed during the rounds of play. Instead, the players agree to play “per point” and the game is scored in points, similar to card games like hearts or gin rummy. Each player’s top hand is compared to his or her opponents’ top hand, the middle to the middle, and the bottom to the bottom. 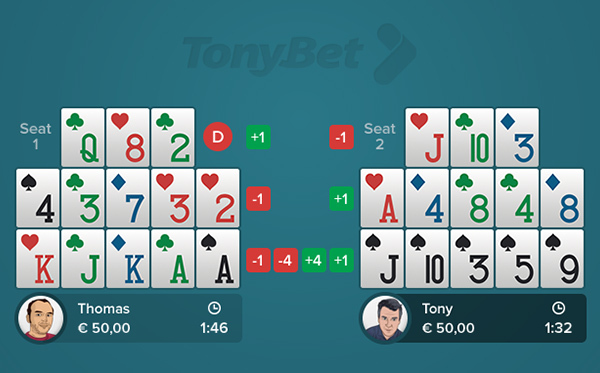 A player will win or lose points, based on how his or her hand measures up. The three hands are scored and compared as regular poker hands. The bottom and middle are regular five-card hands. The top only contains three cards, but is scored the same way, thus the best possible hand on top would be three-of-a-kind, while most top hands are high-card hands. Since each player need 13 cards from the deck, OFC is played with a maximum of four players. Most commonly, the game is played heads-up between just two opponents. 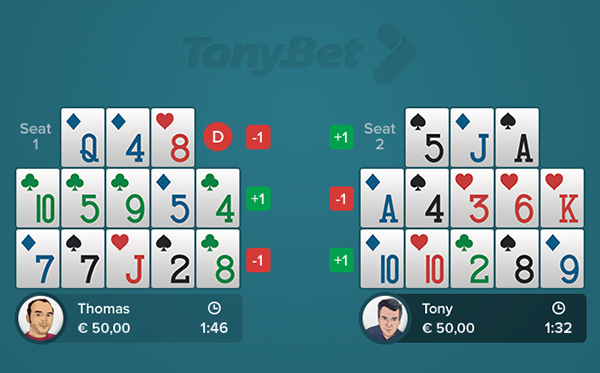 The first objective of OFC is to make a “qualifying” hand. There is a strict rule that the bottom hand must be at least as good as the middle hand, and that the middle hand must be at least as good as the top hand. Since a player is arranging his cards one at a time, this isn’t always possible. If he or she has already played a pair of kings in middle, and has a straight draw on the bottom using cards all lower than a king, he or she must complete the straight. In OFC, as in bowling, if you hand has fouled (failed to qualify), then you get a zero for the frame. There is no fine and no penalty box, but your top, middle, and bottom are all marked as zero. As long as your opponent makes a qualifying hand, he or she will beat your top, middle, and bottom. Like hold’em games, OFC is played with a dealer button. The player to the left of the button acts first on every street, the action moves clockwise, and the button moves after every hand. At the start, players get five cards to play in turn, playing each card top, middle, or bottom. The cards are arranged face-up on the table, hence “open-face” Chinese poker. Once a player arranges the cards and indicates that his or her turn is complete, the next player flips over all five cards and starts their own arrangement. After the first turn, players get cards one at a time, and play them face up, in turn. Once you play a card top, middle, or bottom, you can’t move it to a different row later. There are no take backs. If you have read this far, and are familiar with the basics of poker hands (a flush beats a straight, quads beat a full house, etc. ), then you are ready to play OFC. As long as you trust your opponent, or an impartial judge, to score the hands, go ahead and get a game started. The basics of scoring are simple, but there are a number of detailed cases to account for. Don’t get overwhelmed. Like casino slots or Candy Crush, you can start playing the game without knowing all of the scoring details right away and learn as you go. OFC is played per point, so scoring of the final hands (after all 13 cards are placed) is done on a point basis. Each row, (top, middle, and bottom), is worth one point to the winner. So if you have a pair of jacks in the middle and your opponent has king high, then you win one point in the middle. In this hand, "moscow25" wins the bottom and top rows, but loses the middle row. Therefore, he wins one point overall. 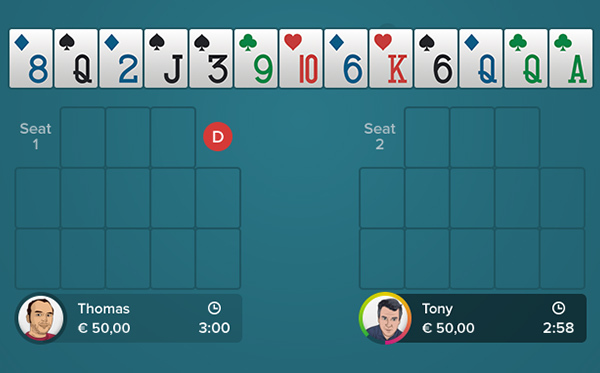 If playing OFC three- or four-handed, each player scores against each player independently. Thus, unlike in hold’em, where the best hand that doesn’t fold gets everything and everyone else gets nothing, there is no folding. For example, if Bob beats Ted but loses to Joe, Bob still wins points from Ted. In addition to the +1/-1 points per row, there are a myriad of scoring bonuses that can be worth a lot more than one point. 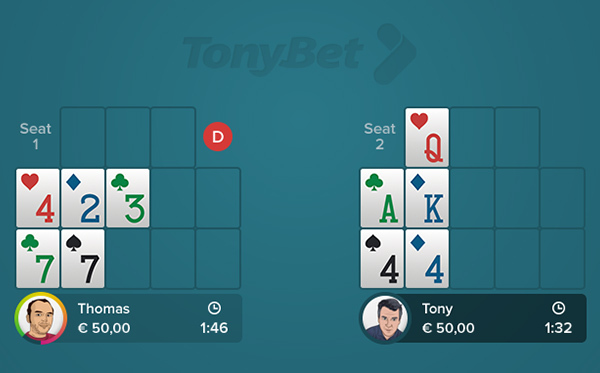 The most common OFC scoring bonus is the “scoop bonus.” If you beat an opponent's top, middle, and bottom, you win an additional three points. This is sometimes referred to as the “1-6” scoring system. If you beat your opponent two out of three rows, you win one point overall. If you scoop him, it’s worth six points overall. 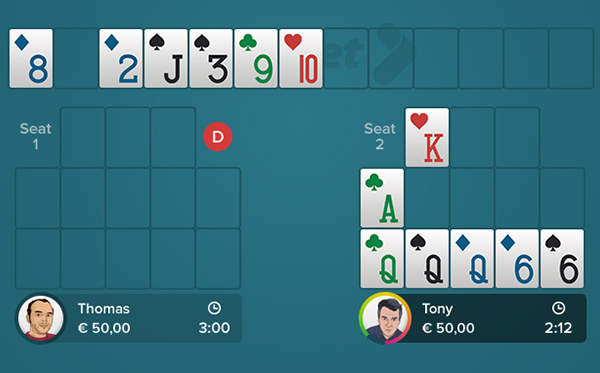 To encourage players to take chances for big hands, OFC rewards good hands in every row with different point bonuses. These bonuses are given, as long as a player makes a qualifying hand, regardless of whether the hand wins or loses. Here, "moscow25" makes a straight on the bottom, but loses to a his opponent’s bigger straight on the bottom. His opponent gets one point for winning the row, plus a two-point bonus for the straight. However, "moscow25" still gets two points for his straight. Therefore, the straight bonuses cancel each other out, and "moscow25" loses just one point on the bottom row. Bonuses for bottom-row hands range from +2 for a straight to +25 for a royal flush. Middle bonuses start with +2 for three-of-a-kind, going up to +50 for a royal flush. Bonuses for the top hand start with +1 for a pair of sixes and then increase from there. The full list is below. In addition to the bonuses for big hands, there’s a special rule, which started out as another way to add drama to the game, but has since become a standard, big part of OFC strategy. 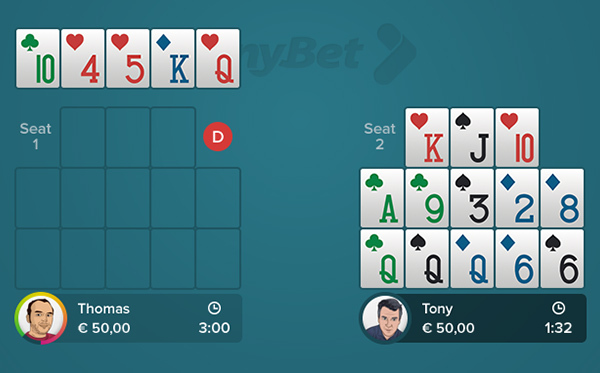 Playing with "Fantasyland” is optional, and must be agreed to before an OFC game begins. Most OFC games played online and in public casinos are played with the Fantasyland option. Make sure you know whether you’re playing with or without Fantasyland before you join. Fantasyland is treated as a bonus round of OFC. 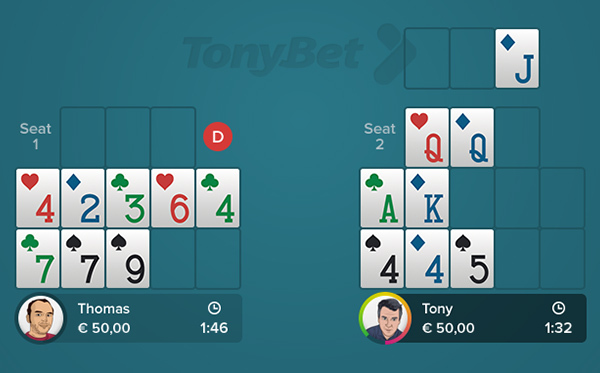 It’s common for the button not to move, and a player is not allowed to quit or get dealt out of the hand during his opponent’s Fantasyland round. The player in Fantasyland has a big advantage because he or she is dealt all 13 cards at once, instead of the starting five and then one at a time. The player then sets the cards face down in turn, and then waits for his opponents to play their hands according to standard OFC rules. 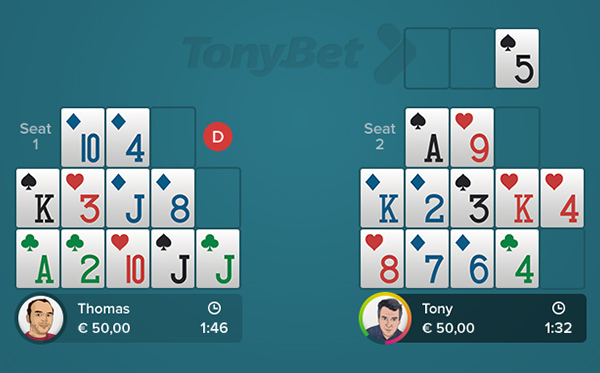 Once all players are finished setting, the Fantasyland hand is revealed and scored like a regular OFC hand. Thus, a player in Fantasyland, after rounds and rounds of setting his hand imperfectly because he doesn’t know what’s coming, is able to set his hand perfectly. It is too easy to make or better on top while in Fantasyland, which you can see all 13 cards at once, so the rules for remaining in Fantasyland are a bit stricter. While it’s OK to quit the game or to get dealt out to take a smoke or a phone call at the beginning of an OFC hand, any hand started must be completed until scoring. Since Fantasyland is treated as the extension of a previous hand, and the player in Fantasyland has a clear advantage, players at the table are not allowed to quit or skip the Fantasyland hand, if they played the hand that led to it. There is also a common-courtesy rule that asks the player in Fantasyland to announce that he or she is “staying” in Fantasyland. House rules vary, but it’s also common for the Fantasyland player to set the hand face-down, and not change it before the other players start their round. OFC is still a new game, however, the common rules for “standard OFC with Fantasyland” described above are nearly universal, both online and in the casinos that increasingly spread OFC whenever the poker tournament circuit comes to town. There are also a few variants of the game that have caught a bit of steam in the poker community. One well-known variant is “criss-cross OFC,” which simply consists of two player playing two hands each, to form a four-handed OFC game. The hottest new variant of OFC that actually changes some rules is called "pineapple OFC." Like other “pineapple” variants of poker games like Omaha and Texas hold’em, pineapple OFC deals each player three cards instead of one card per round, and that player must play two cards in turn, while discarding one. Open-face Chinese poker is a new and exciting form of poker. It combines simple rules and the drama of drawing for big hands, as in Texas hold’em and seven-card stud, with the high variance of games like blackjack. The game is easy to learn and intuitive to play (don’t be scared by the table of bonuses), and like any good poker game, a beginner can win right away. Even better, unlike hearts, gin rummy, or even Texas hold’em (without the hole-card camera), you can learn the game by watching top players play. The game is played face up, so at every point in time, the player and the spectators have the same exact information. Since the beginning of 2013, OFC has taken off as a mobile game. The screenshots used above to illustrate OFC rules are from the ABC Open-Face Chinese Poker App, available for the iPhone and iPad. There are several other good apps for playing OFC on mobile, against friends, against strangers, or against a computer opponent. We’ll see you in Fantasyland! OFC rules have been contributed by Nikolai Yakovenko. Known as "Googles," Yakovenko is originally from Moscow, Russia and is now a poker player and software developer residing in Brooklyn, New York. Yakovenko has made both World Series of Poker and World Poker Tour final tables. Meanwhile after several years at Google New York working on ranking algorithms, he's been developing independent software projects ever since. He also helped create the ABC Open-Face Chinese Poker iPhone App. You can follow Yakovenko on Twittter at @ivan_bezdomny.